The press releases state that the part of Class A Notes were sold to KFW with the benefit of a AAA/Aaa guarantee from the European Investment Fund. Whilst details were not made public, typically EIF undertake their own risk analysis on the underlying assets to derive an internal rating. This rating, together with various other considerations, drives their premium pricing. Additionally, the Class C and D notes were issued at a discount to par, suggesting that they were marketed to external investors based on their discounted margin timed to the clean up call date. By offering them at a discount rather than increasing the simple margin, this eliminates the need for the issuer to increase the underlying credit enhancement. However, this discount results in the seller receiving reduced sale proceeds from the notes’ issue proceeds. 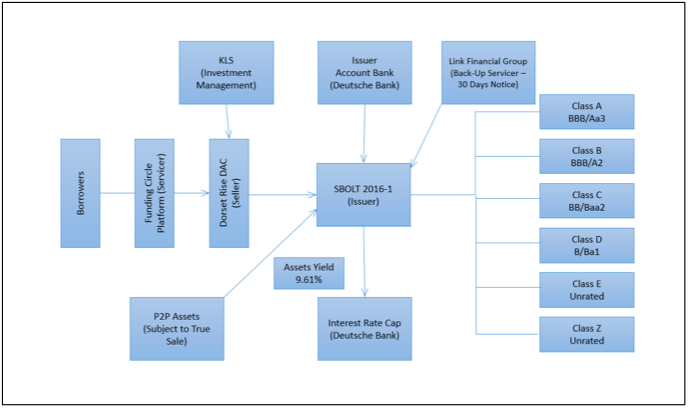 Finally, the offering circular states that KLS Diversified Master Fund L.P will not only retain the Class Z notes (as part of their 5% skin in the game) but will also hold the full allocation of the Class E notes. All the rated notes have ‘split ratings’. In the case of the Class A notes, the difference is five notches (Aa3 Moody’s and BBB Standard & Poor’s). One area which might explain Standard & Poor’s comparatively lower ratings is their treatment of recovery rates on defaulted assets. Funding Circle’s most seasoned vintage (2011) shows observed cumulative recovery rates topping out just north of 40%, while more recent vintages show partial recovery rates projected to be in the region of 25%. Notwithstanding these observations, Standard & Poor’s modelled recoveries at 0% across all stresses whilst Moody’s assumed a comparatively realistic 20-25%. In addition, Moody’s ran stresses using a prepayment assumption of 8% compared with Standard & Poor’s 30% - the latter putting more constraint on available excess spread. Interestingly, notwithstanding the split ratings, Standard & Poor’s concluded base case or steady state cumulative gross loss levels of 12.5% compared to Moody’s 10% – both more or less in line with the worst case observed vintage (1H 2011) from Funding Circle’s historic book. One additional difference between the two rating agencies is that Moody’s analysis rates the deal using their granular SME receivables criteria while Standard & Poor’s have opted to use their consumer credit rating criteria. The underlying P2P assets all carry a fixed rate of interest with a weighted average rate of 9.57% on closing. However, the Class A to E notes are LIBOR linked, therefore the issuer is exposed to interest rate risk in a rising LIBOR environment. The risk is largely mitigated through an ‘out-of-the-money’ amortising interest rate cap provided by Deutsche Bank (Baa2/BBB+) with a 3% strike rate. This means that the interest rate risk is unhedged for the first 2.5% increase until the cap kicks in. However, since the notional balance of the interest rate swap is linked to the value of the outstanding Class A to D notes (rather than the performing loan balance), this results in a reduction of excess spread when the interest rate cap is in the money. In terms of credit enhancement, the senior notes benefit from subordination provided by the lower note classes. In addition all notes benefit from a Cash Reserve Account – partially funded on closing. The Cash Reserve Account is designed to use excess spread during the first year to bring it to the full required or target balance – after that it amortizes in line with the rated notes subject to a £3.9 million floor. In addition all note classes benefit from a principal deficiency ledger mechanism, which uses available excess spread at different points in the waterfall to deleverage the note principal in sequential order. Moreover, because the issuer employs a prudent provisioning mechanism relating to the value of defaults – compared to the more common ‘realised losses’ – this will benefit the more senior noteholders at the expense of interest on the Class E and Class Z notes. With a weighted cost of debt on closing of 3.3% supported by weighted average coupon of 9.57% on the assets, the notes are not expected to suffer from a lack of liquidity to pay the note interest. Nonetheless, the structure benefits from a cash based liquidity reserve which covers roughly a month’s interest for the most senior notes outstanding. In addition, if this isn’t sufficient, again, the most senior notes outstanding benefit from a ‘principal draw mechanism’ which allows principal funds to be borrowed to supplement senior costs and interest. Unusually for this type of deal, the provisional pool cut was less than the final pool, meaning that additional loans were added to the final pool subsequent to the provisional pool cut date. This has resulted in Funding Circle providing exceptional warranties whereby they need to repurchase any loan that fails to make any one month’s payment during the first three months of its life. With any new asset class, the rating agencies put the market for and availability of back-up servicers under the spotlight. Should a servicer termination event arise, Link Outsourcing Limited - who were Funding Circle’s primary servicer until February 2014 - are contracted to take over servicing duties. Moody’s and Standard & Poor’s undertook extensive stress testing using their respective criteria and cash flow models in order to derive the ratings. These stresses included assuming multiples of historic defaults coupled with short term delinquencies, high prepayment scenarios and rising interest rates. At a time when Moody’s placed three tranches of rated notes backed by similar assets from the US on review for downgrade, both rating agencies will be keen to ensure that SBOLT 2016-1 doesn’t suffer from a similar fate. For this reason, we can probably assume that they have demanded additional cushion in the form of extra credit enhancement to absorb any potential sub-performance of the underlying assets without triggering a ratings downgrade. In contrast, for those ‘pioneer’ investors who are willing to take longer term views, it’s worth remembering that in the past rating agencies have sometimes dialled back both on their stress levels and base cases as more historical data becomes available. Under these circumstances, existing deals can benefit from ratings uplift purely by dint of their long seasoning and beneficially revised criteria. Luke Mellor is the founding partner of Creative Capital Partners, a securitisation consultancy. Creative Capital Partners also hold seminars worldwide on securitisation structuring and financial modelling for ABS, CLOs and RMBS.